The working life of a doctor did not appeal to Robert F. Mougeot '65. The Arizona native enrolled at Oxy as a pre-med major, but after two years of studies he asked himself, "Do I really want to do this?" So he switched majors to political science with the intention of going to law school. But then his experiences with Professor Laurence De Rycke piqued an interest in accounting and finance-and this one stuck. "De Rycke taught a whole year of accounting in one semester," Bob recalls, something he discovered as he later took additional courses to prepare for the CPA exam. Looking back, Bob appreciated Oxy's emphasis on written and oral communications alike: It was the kind of education that "taught me how to learn." His favorite professor was Raymond McKelvey, for whom he also worked as a grader, and his favorite course was Practical Problems of Political Control-an especially interesting class to take against the background of the Cuban Missile Crisis. After graduating from Oxy, Bob went to work for Arthur Andersen & Co., the longtime "Big Eight" accounting firm. When his Army reserve unit was activated, he was sent to Schofield Barracks, Hawaii, where he met his future wife in May 1968. Thanh Ngo left Vietnam with her family in the late 1950s due to the country's continued unrest, escaping to Laos, where she was hired by USAID to be a radio operator (she is fluent in five languages). After she moved to Honolulu, Thanh taught Vietnamese to American servicemen; Bob was one of her students. Bob and Thanh were married on Valentine's Day, 1969. Once his Army service was over, Bob completed his master's in accounting at Arizona State University and returned to Andersen, eventually becoming an audit partner after postings in Phoenix, Melbourne, and San Francisco. When Hawaiian Electric Industries recruited Bob in 1988, the couple retraced their steps to the Aloha State. He worked at HEI for 14 years, retired as vice president of finance and chief financial officer, and subsequently moved back to San Carlos. 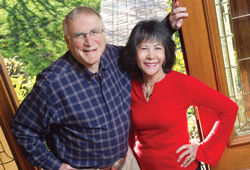 Through Oxy, the Mougeots have set up three charitable gift annuities, which provide them with a steady stream of income for the rest of their lives. They have designated the remainder of their annuities to current-year scholarship support. Bob went to Occidental on a scholarship that he says came at an important time in his life. Furthermore, upon his and Thanh's death, the remaining funds in his IRA account will be given to Occidental. They want Oxy to continue to recruit top-notch students and faculty, and they trust that the College will do so. "Bob is very proud of Occidental-he values his education a great deal," Thanh says, to which her husband adds: "Now-as perhaps never before-we need to teach how to have a 'civil discourse' on different, competing ideas. I hope our support allows Oxy to graduate young people who can critically look at issues, understand the perspectives of others, and come up with possible solutions." The cost/benefit analysis of a liberal arts education makes sense to this financial executive. To learn how you can make a gift to Oxy, contact Office of Gift Planning at (323) 259-2644 or giftplanning@oxy.edu.